Cupertino Mayor Steven Scharf’s State of the City Address last week had plenty of jokes. But one remark isn’t getting laughs a week later. Regional groups, housing advocates and South Bay elected officials took the comment as a case of NIMBY provincialism from the mayor of a city known the world over as the home of mega-employer, Apple Inc. Scharf’s speeches were also filled with sharp words for State of California efforts to build more housing and comments advocating for local control. 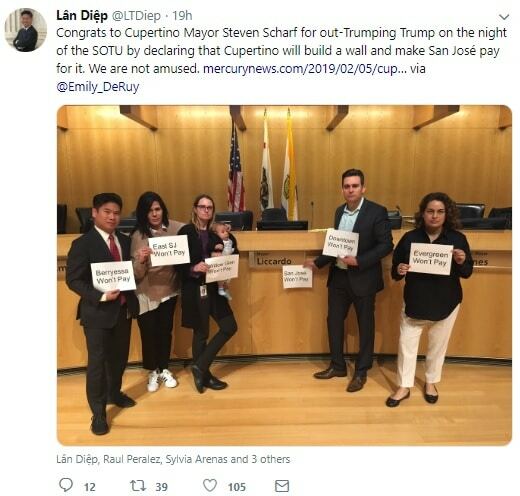 The Bay Area Council and San Jose council members Dev Davis and Lân Diệp chimed in on Twitter, with Diệp’s post featuring individuals holding signs with the names of various San Jose neighborhoods vowing not to pay for a “wall.” Davis’ terse remark made reference to Apple. The remark has received plenty of Bay Area media attention in the last 24 hours including the The Guardian, which is based in the United Kingdom. Click here to access tweet. You can read about Scharf’s speeches here and view the City of Cupertino’s recordings here. 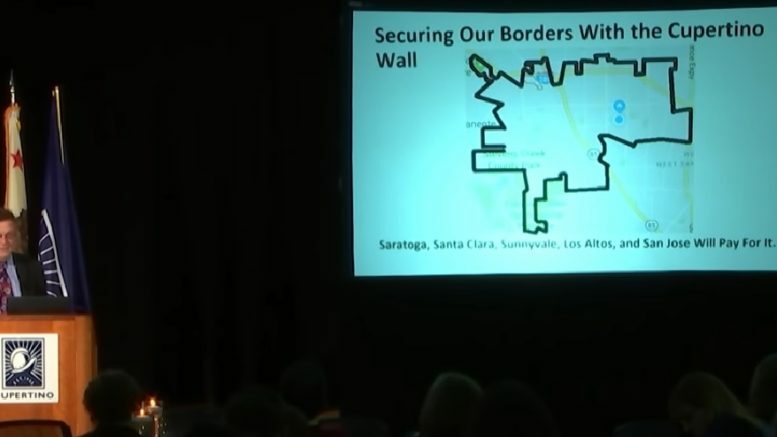 Be the first to comment on "Build a “wall” around Cupertino? Mayor hammered for joke"